The war in Syria has not only destroyed the lives of millions of people but it has also seen the involvement of numerous regional states scrambling for political influence. 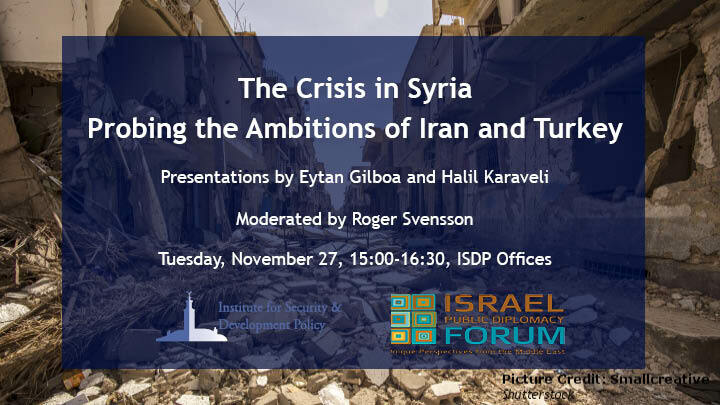 In this ISDP Forum jointly organized by ISDP and the Israel Public Diplomacy Forum, Prof Eytan Gilboa of Bar-Ilan University will give a presentation on Iran’s ambitions in Syria, followed by Mr Halil Karaveli, Senior Fellow at ISDP giving an overview of Turkey’s involvement in the country. After the presentations there will be time for Q&A. The Forum will be moderated by Mr Roger Svensson, Senior Fellow at ISDP.